Greystone Pet Hospital truly believes that our personal attention to each patient and client is what makes our surgical services unique. Staffed by a team of highly trained veterinarians and experienced veterinary technicians, we are proud of the quality of surgical care we provide and the wide range of surgical procedures we offer. Beyond spay and neuter surgeries, the doctors at Greystone Pet Hospital perform an array of orthopedic and soft tissue surgeries. We also believe that identifying and relieving pain is important to the recovery of your pet. 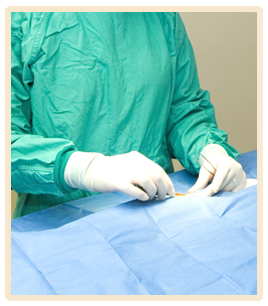 Therefore, pain management is an important aspect of our intra- and post-surgical protocols. At discharge, we may also send additional pain management medication home with you and your pet after providing a thorough explanation of its proper use and dosage. Ensuring the health and safety of your pet during surgery is of the utmost importance and requires an anesthetic and monitoring regimen that adheres to the highest principles and ideals of veterinary medicine. At Greystone Pet Hospital your pet has access to state-of-the-art anesthetic administration and cardiovascular monitoring equipment and protocols. As your pet is being discharged from our hospital, our experienced technician will meet with you. We will provide you with detailed written instructions on how to properly care for your pet at home after surgery. We are also happy to answer any questions or concerns that may arise once you get your pet home. You can also expect a follow-up call from us within 24 hours of your pet's surgery.